This reader eases students into reading continuous, original Homeric Greek. Fifteen passages from the Iliad are included with pre-reading materials, grammatical and comprehension exercises, vocabulary and grammar notes, and more. Homer: A Transitional Reader moves students with incipient proficiency in reading Attic Greek into the Greek of the Homeric poems. Fifteen selections from the Iliad progress through readings of graduated increasing length. Each selection begins with a reading that has metrical and dialectical challenges resolved. A set of thought questions and the unaltered text with literary and metrical notes and vocabulary glosses follow. Post-reading questions encourage students to delve into fuller understanding and appreciation of what they've read. This book is the latest addition to a vast tradition of school textbooks on Homer, school poet par excellence throughout history. According to the authors it is aimed at students on an intermediate level. Closer inspection indeed shows that this book is written for those whose knowledge of ancient Greek is nascent, but who still need a lot of explaining by means of vocabulary, grammatical notes, metrical support, and questions showing points of interest that could otherwise remain unnoticed by untrained readers of Homeric Greek. This volume is part of Bolchazy-Carducci's series of ‘transitional readers’, which also includes a volume on excerpts from Plato, and five Latin textbooks, In each case the aim is to provide the student with enough aids to start reading classical texts in the original language. As the approach of the Greek series is basically in keeping with the Latin volumes, I refer to two earlier reviews of similar Latin readers in BMCR.1 The core of the book consists of fifteen chapters called “readings,” each of which contains a short selection from the Iliad; the shortest passage is seven lines, the longest thirty-five. These are preceded by a preface and acknowledgments, two brief introductions (one on Homer, one on meter), and a list of abbreviations. There are three appendices, containing a glossary of figures of speech, a glossary of significant names, and a vocabulary in which some 750 words are listed. There is no bibliography, although a brief list of titles is included in the introduction under “suggested further reading.” The fifteen readings are not constructed as a random anthology, but should be studied in the order in which they are presented. In this way the student can not only follow the chronological order of the Iliad’s story, but, more importantly, can benefit from the progressive grammatical lessons. The first reading, for example, presents some grammatical background on participles and their aspect, information necessary for all subsequent readings. Other readings focus on the infinitive, imperatives, particles, compounds, hypotaxis, etc. Each section thus contains a grammatical brush-up immediately applicable to the Greek passage included. Some readings include brief exercises as well (in sections titled ‘Stopping for some practice’), complete with blank lines to fill in the correct forms, which at times gives the volume the appearance of a school workbook. This is, however, not a comprehensive introduction to Homeric grammar. All grammar presented is primarily included to support the reading of the passages presented. The chapters also have preparatory pre-reading and reflective after-reading sections, containing typical questions a teacher would discuss. The most striking didactic technique applied in each reading, however, is the fact that each Greek passage is presented twice: once with the elisions spelled out and additional articles, and without the contractions and some of the grammatical irregularities, and once more, at the end of the chapter, in the unaltered original. The idea is that through pre-reading remarks, summaries, grammar, notes, vocabulary, and the simplified and glossed Greek text, the student is prepared gradually for the real work. A typical chapter thus contains the following sections: 1. Before you read what Homer composed: introduction, grammar, practice. 2. Helping you read what Homer composed: vocabulary, grammatical notes, questions ‘as you read’, summary, ‘making sense of it’ (i.e. the edited text). 3. What Homer actually composed: vocabulary, notes, questions ‘as you read’, ‘as it was’ (unaltered text). 4. After reading what Homer composed. The idea of presenting two versions of each passage is not bad, although this process could become a bit tedious after a few readings. The texts differ only slightly, the simplified text being marked by bold and italic typeface referring to the notes. The original text at the end of the chapter can therefore feel like an afterthought, in which the student hardly finds anything new. Most difficulties have been given attention already, and the student can show what he has learned, once again, without the net. Interestingly, however, the authors have included a different set of notes for each version of the text: the edited text is provided with mainly grammatical notes and assistance, whereas a second set of notes, added to the unaltered text, deals with stylistic and metrical issues, or the literary merits of the passage. In this way the second, unaltered version of the passage can offer many new insights. Quite original is the way in which the authors have made an effort to make their students empathize with the narrative of the Iliad. Parallels with the psychological trauma of Vietnam soldiers heighten the impact of the atrocities of war. 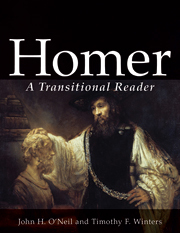 The suggested reading list too includes two titles one does not find in most Homer readers.2 Strong points are the comprehensive nature of the approach chosen by the authors. Attention is paid to a wide palette of relevant grammar, syntax, style, diction, vocabulary, meter, the nature of Homeric poetry, and even basic textual criticism, e.g. the explanation of the lectio difficilior on p. 18. The notes do not, however, refer to standard works such as e.g. Smyth’s grammar. The appendices are useful and the list of figures of speech (appendix A) comes with good examples. Quibbles: although the Greek passages are short, they are printed in an unnecessarily large type size, as if the average student cannot read regularly printed Greek without thick glasses. The result is a text that is actually less easy to read. The font chosen (Palatino Linotype), moreover, does not excel in legibility with regard to accents and breathings, which are printed very thin. The few titles in the suggested reading list are helpful, though necessarily somewhat random. For the intermediate student a reference to M.L. West’s Introduction to Greek Metre (Oxford 1987) would perhaps be more useful than his Greek Metre (p. xvii), although the latter is the standard. No reference is made to the modern standard Cambridge Iliad commentary of B. Hainsworth, G.S. Kirk , R. Janko et al.3 Few would agree that anacolouthon and aposiopesis are two different names for the same figure (p. 108). It would be petty to criticize the choice of selected passages made (from books 1, 3, 5, 6, 16, 18 and 22); the classic 24 may not be there, but otherwise the authors have made a sensible choice. This book seems to deliver just what it aims to do. Altogether 271 lines are presented, neatly divided in fifteen readings, replete with all kinds of aids, most of which I found very much to the point. The authors have found a good balance between ambition and feasibility, and focus on many different aspects relevant for first-time readers of the Iliad in the original Greek. The variety of student editions of Homer may be large, but few are as clearly aimed at the intermediate level as this book, which may well prove to be the missing link between basic grammar exercise books (which usually do not offer authentic Greek, let alone poetry) and more advanced undergraduate editions, such as e.g. Janet Watson’s Bristol edition.4 Although the spacious layout and the high school type exercises may seem a bit too elementary for more accomplished students, I expect that many students and teachers will be happy to use this well-thought-out reader as a useful introductory guide to the Iliad and to Homer’s Greek. -------------------------------------------------------------------------------- Notes: 1. Thomas J. Sienkewicz, LeaAnn A. Osburn, Vergil. A Legamus Transitional Reader; BMCR 2004.09.38. Ronnie Ancona, David J. Murphy, Horace: A Legamus Transitional Reader; BMCR 2009.07.45. 2. Jonathan Shay, 1994. Achilles in Vietnam: Combat Trauma and the Undoing of Character. New York; id. 2002. Odysseus in America: Combat Trauma and the Trials of Homecoming. New York. 3. Geoffrey S. Kirk (general editor), 1985-93. The Iliad: A Commentary (6 vols.). Cambridge. 4. Janet Watson, 2002. Homer: Odyssey VI & VII. Edited with introduction, notes and vocabulary. London.